Last Friday it was 20 degrees when the Labs and I sauntered down the frozen dirt road to the river. I was thinking of a friend of mine, a fellow stunned by the disappearance of his wife, a woman who abandoned him when he was ill and vulnerable. He is recovering now, making a new life for himself on his own, and that is good. 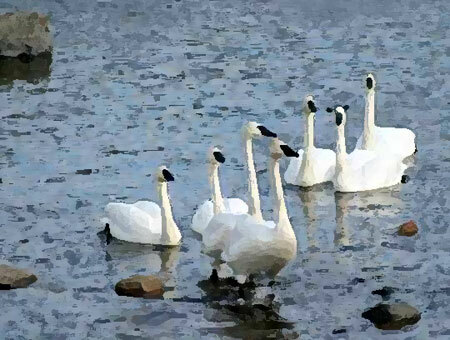 Down that road, just after sunrise, the dogs and I discovered seven trumpeter swans, parked in the grey swaying water. They are Celtic, these birds. Their majestic cries heard overhead each November mean snow is possible until they migrate back again, when their whistles and wing flaps communicate the message that spring will once more come 'round. There are many stories about swans. One is the Chinook legend of the Seven White Swans. When you see seven together, it means goodness is in store for you. The kind of luck that brings you a sweetheart, someone who is true to you; not two-faced, but genuine. As the Chinooks tell it, a young girl named Be-be was born crippled, yet was loved deeply by her mother, so she was given the chance to learn to walk, even though she dragged one foot behind the other. She was not perfect, but her face was beautiful, and her soul was kind, and she loved to laugh. One of the braves, a strong handsome hunter, confident in his aim, asked her to come with him. "I am not pretty, and I cannot dance like the others," she said. "I will move for us both," he told her. "And you will always be young, with that beautiful face and that rare soul and that love of laughter." She believed him, and became his mate. Over the years they had six children, all healthy and strong. One day a woman, tall and pretty, came to visit the tribe. She attracted the attention of the men, including the hunter, because she was a fine dancer. The hunter went off with the dancer, leaving Be-be alone to raise their children. Other men came to Be-be, telling her that the hunter would never return, insisting she should marry one of them. She refused all, concentrating her grief on the important task of raising her children right. Years went by. Everyone else grew old in mind and body, yet Be-be's face and spirit stayed youthful. Far away, the hunter grew older, his aim not so sure, the dancer still by his side, a woman aged with stooped shoulders, as she never had a spirit worth knowing, and she could no longer dance. One day the hunter -- who had never forgotten Be-be -- returned to see her beautiful face and hear her laugh. Bent and old as he was, he bowed to her. She reached out her hand to him. But the gods spoke from the sky. "The untrue can never permanently mate with the true," they said. "We shall honor Be-be and her children in such a way that their youth, beauty and laughter shall forever taunt your unloyal heart. They will never be old, and the crippled Be-Be will become glorified in natural grace. They will remind you of what you have abandoned." And the gods turned Be-be and her children into seven swans, each representing one trait - beauty, grace, laughter, youth, fidelity, love and truth - to remind the hunter of the seven glorious things he had forfeited. "Tuonela, the land of death, the hell of Finnish mythology, is surrounded by a large river of black waters and a rapid current, in which the swan of Tuonela glides majestically, singing." That's beautiful, Dave. A lesson for us all.